It takes effort to move scholarly publishing forward. And the traditional publishers have not all shown to be good at that: we're still basically stuck with machine-broken channels like PDFs and ReadCubes. They seem to all love text mining, but only if they can do it themselves. Fortunately, there are plenty of people who do like to make a difference and like to innovate. I find this important, because if we do not do it, who will. Two people who make an effort are two researchers who recently published their work as conference proceedings: Tobias Kuhn and Finn Nielsen. And I am happy to have been able to contribute to both efforts. Tobias works on nanopublications which innovates how we make knowledge machine readable. And I have stressed how important this is in my blog for years. Nanopublications describe how knowledge is captures, makes it FAIR, but importantly, it links the knowledge to the research that led to the knowledge. His recent conference proceedings details how nanopublications can be used to establish incremental knowledge. That is, given two sets of nanopubblications, it determines which have been removed, added, and changed. The paper continues outlining how that can be used to reduce, for example, download sizes and how it can help establish an efficient change history. And Finn developed Scholia, an interface not unlike Web-of-Science. 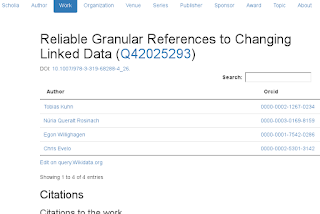 But then based on Wikidata and therefore fully on CCZero data. And, with a community actively adding the full history of scholarly literature and the citations between papers, courtesy to the Initiative for Open Citations. This is opening up a lot of possibilities: from keeping track of articles citing your work, to get alerts of articles publishing new data on your favorite gene or metabolite. 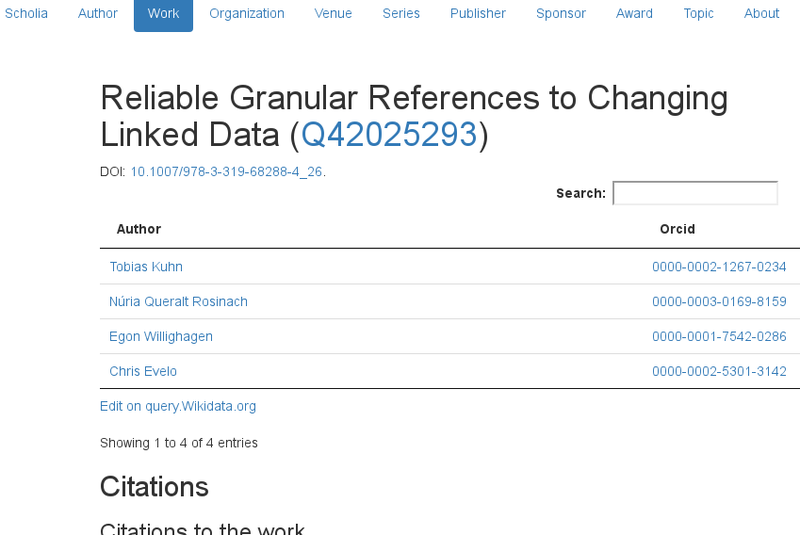 Nielsen FÃ, Mietchen D, Willighagen E. Scholia and scientometrics with Wikidata. arXiv.org; 2017. Available from: http://arxiv.org/abs/1703.04222. new paper: "The future of metabolomics in ELIXIR"